Though I was living in Ocala at the time, I had one of the most profound experiences of my life. Of course, one might argue that there is nothing divine about Ocala, but I was not in Ocala when this happened. I was at a small Temple in a small town outside of Ocala. There was this unpretentious family-run Temple way out there, way out there, but it was beautiful, and the Murti were lovely and adored. Though I think I was found to be an amusing curiosity, the Indian women took me in and accepted me into their circle. I have found Hindu’s, particularly the women, to be quite warm and open. And I will tell you with no hesitation that the homemade Indian food cooked at this Temple was easily the best Indian food I have ever eaten. I do not remember the particulars of the event, but they were having a series of ceremonies and celebrations in devotion to Lord Shiva. A year or so before it was Lord Shiva who had called me, quite unexpectedly, into my spiritual life, so I was eager to attend. In nothing more or less than classic Indian fashion, we were all seated tight to one another on the floor without so much as a footstep between us to spare. This night the Temple was full of devotees who were not terribly devoted… lots and lots of special occasion devotees. As is almost always the case, I was the only white girl in attendance. The Pundit entered to no shortage of fanfare, and he spoke passionately about Lord Shiva and told lengthy stories about him. Keep in mind that a day or so earlier I had come in and volunteered to help set up for this event, and I will say that I worked as hard or harder than anyone. beautiful as it was, I felt uncomfortable, cramped, the atmosphere was stuffy and heavy, so about all I had on my mind was leaving. To make matters worse the room was filled with Indians who evidently had little respect or involvement in their beautiful religion. Though a few actually did so, it seemed that at any moment everyone in the room was a hair’s breadth away from slipping their cellphones out of their pockets. Some, of course, were inspired and involved, but many, it seemed, were missing an “important” football game for this. A religious experience was the last thing on my mind. In fact as I looked about the crowd I began to worry that they may run out of the fabulous food and it may be wise for me to make my way towards the back so I could get in line early. The Pundit played a powerful version of one of the most significant chants in the tradition, “Om Namah Shivaya.” I closed my eyes and chanted along. The Pundit scolded the devotees for being so undevoted and uninspired in their singing, chanting, lives, and in the Temple. I was surprised how strongly he chastised them. But the lacklustre singing went on while the chant played loudly overhead. Eyes closed, I chanted, and soon forgot about the stuffiness, the cellphones, the food, the uninspired devotees. All at once I had no weight, and felt my consciousness like a feather, a thing separate from my worldly concerns and physical limitations. And then a thing that has never happened to me before, a thing I had no idea of or experience of happened. Tears streamed down my cheeks. What was this? I needed aid. 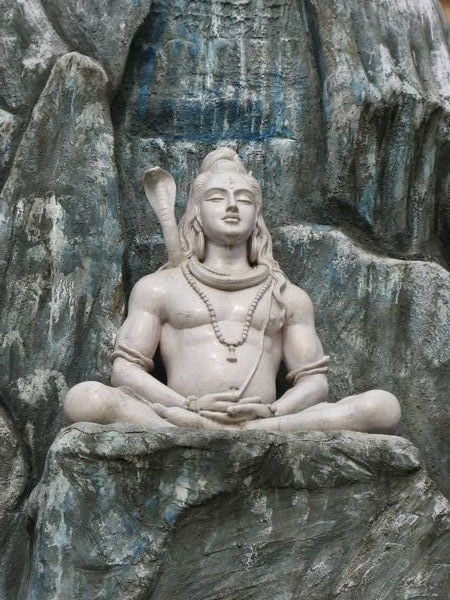 I needed Lord Shiva, and I had NO idea that crying tears for him had such meaning. The timing was simply profound, as divine as clarity. And here again is why I am practicing Hindusim… because I am so obviously meant to be doing so. Such timing and ecstatic experiences give me an experience of God that I found so lacking when I was a Christian. I am sorry, but I cannot simply believe in a cold God that demands blind faith. I and others who adore the Hindu ways know that it is better to experience God than to believe in God. And again I quite agree with you. I have written on this topic extensively in my blog (In Russian, sorry). The problem with modern religions (not only Christianity, but Islam and Judaism too I think) is the lack of mysticism. Christianity is supposed to be the most mystical religion among them with all its Sacraments. But ask any Christian, Catholic, Orthodox or Protestant, how often do they experience something mystical during the Sacraments? I think 99,99% will say “just never’. Our forefathers were more lucky. They had Eleusinian Mysteries and other similar events where one could supposedly EXPERIENCE something mystical or otherworldly. I think a mystical religious experience can cure your fear of death forever, but how many modern western people can say they have experienced something like that? Something beyond this mundane live? Next to nobody, that would be my guess. That’s where all fear of death, terrorism etc. come from. Early Christianity had something that was called Disciplina Arcani, was that some entheogenic form of the Eucharist? I don’t know. Some try to obtain faith through phenomena like EVP, see for example http://www.dailymail.co.uk/news/article-2134547/Hi-Daddy-I-love–Engineer-talks-dead-teenage-daughter-developing-paranormal-detection-devices.html That’s still better than “a cold God who does not answer”. Again, I want you to know that I value your thoughtful and educated input. For me, the cold god and blind faith of Christianity was a misery of doubt and damnation. But that was the sort of Christianity I grew up with… how dysfunctional is that? I suppose some sort of mystical experience may have helped, and I did not even have the ceremonial beauty of Catholicism to keep me going… just guilt and blind faith, sorry God, that’s just not enough.